Beta Canum Venaticorum (Chara, Asterion, Gliese 475, Chang Chen Si) - Singular yellow dwarf (G0) located 27 light-years from Earth. Widely noted as a solar analog, BCV is older and poorer in metals (96 percent of Sol). 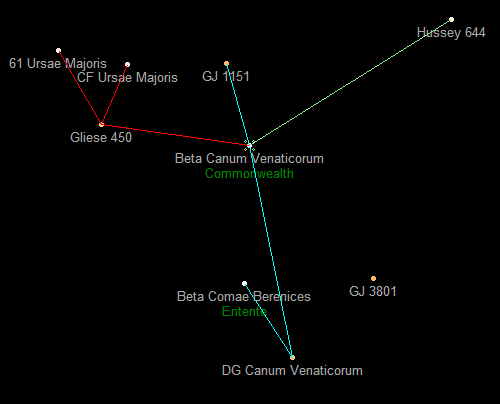 Its system includes five rocky planets and three gaseous major planets, all in near-circular orbits. The system is best known for its fourth planet, Commonwealth, which is habitable by humans.